Or join #lojban on Freenode IRC. Join channels for beginners and advanced users. The formatting of this page has been checked for following the guidelines of le uitki. The Complete Lojban Language (also referred to as The CLL, The Red Book, and The Refgram), originally published in 1997, is a complete description of the artificial language Lojban. It serves as a reference grammar for the language, offering an overview of the language, as well as linguistic details on every aspect of the language. This book serves as the standard defining the language design. Though this description may sound imposing, technical and formal, the book is written in a light, often humorous style that teaches the reader about the Lojban language, about logic, and about linguistics in general. 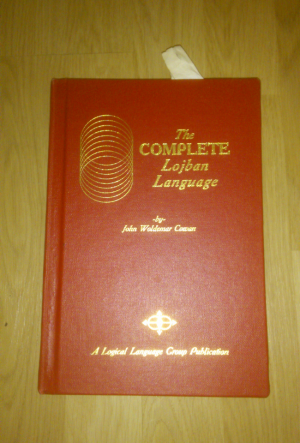 The Logical Language Group, Inc. takes great pride in publishing The Complete Lojban Language, by John Woldemar Cowan. As A Hardcover Book; the default edition sold directly by Amazon is the one provided by the LLG. The book is in hard cover and includes a thorough index and glossary. We do not ship the book ourselves except in special cases; send email to lojban@lojban.org if you have such a special case. PLEASE NOTE that we currently (Jun 2016) are selling it for $50 USD. If it's much more than that, that's not us. It used to be available for purchase on Amazon and from the LLG, but all copies have been sold. Send email to lojban@lojban.org if you'd like to try to get a copy anyway. PLEASE NOTE that the most the LLG has *ever* sold *any* version of this book for is about $50 USD. If you see it offered for much more than that, it is *not* us, and we won't be getting any of that extra money (we've seen copies on sale on Amazon for up to $1,000 USD!). The language design described by the first edition was declared frozen for a minimum 5 year period so that anyone who learned the language from this book could be assured that it wouldn't change unexpectedly. This period ended in 2002. A list of CLL, aka Reference Grammar, Errata is also available, most of which have been approved by the book's author. CLL dot side Errata, arising from The Case Against LA. CLL PEG Errata, for work pertaining to PEG requiring changes to the CLL. Lojban is a current version of Loglan, the artificial language project described in the June 1960 Scientific American article of that name. "Loglan" was also referred to by name in Robert Heinlein's classic novel The Moon is a Harsh Mistress, as well as in other novels. Loglan/Lojban is a language designed for several purposes, including linguistics research (especially involving a proposed test of the Sapir/Whorf hypothesis), foreign language instruction, artificial intelligence research, machine translation and related human/computer interaction applications, and as a stimulating educational and entertaining mental exercise. A few people are interested in Lojban as a prospective international auxiliary language. An international community of aficionados has appeared, writing in and about the language, primarily on the Internet. CLL is known jocularly as the Codex Woldemar, The Red Book, Woldy Codex, The Woldy and Lojbanically as la braxu'e (Big Red Thing), or le gencukta. The Logical Language Group, Inc. is a tax-exempt 501(c)(3) scientific- educational organization, and donations may be tax deductible within the U.S. We acknowledge all donations over $250 in accordance with IRS regulations, and other donations by request. Please make your donations by sending a cheque to the address above, or by donating through PayPal to the LLG. We can accept Internet advance orders via e-mail, but you must followup with verification via postal mail or telephone within 2 weeks. No C.O.D. orders. We require prepayment on purchase orders. This page was last edited on 10 April 2018, at 06:23.